At Irdeto Technology India Pvt. Ltd., we believe that it is our responsibility to ensure that we do business in such a manner that it enriches our environment and planet. That’s why we make sure that we deliver innovative and eco-friendly products to our consumers. We are committed to product stewardship through the life cycle of our electronics, and ensure compliance with E-waste rules in India. E-waste has been defined as “waste electrical and electronic equipment, whole/in part or rejects from their manufacturing and repair process, which are intended to be discarded.” In other words, E-waste or Waste Electrical and Electronic Equipment is the term used to describe old, end-of-life or discarded appliances using electricity. With the increase in usage and dependence on electrical and electronic gadgets such as washing machines, refrigerators, air conditioners etc. there has been increase in E-waste generation in large quantities. A UN report estimates that the world wide generation of E-waste is around 30 to 50 Million tonne per annum. E-waste generally consists of those substances which are hazardous for environment and can seriously affect the health of the human beings. With virgin resources facing rapid depletion, E-waste can be a good alternate resource since it contains many valuable and recoverable materials such as aluminum, copper, gold, silver and ferrous materials. This way, the appliance recycling organised by Greeniva Recycler will be done under best possible conditions, in compliance with E-waste Management and Handling Rules on Waste Electrical and Electronic Equipment. We thank you for fulfilling your responsibility towards environment. Greeniva Recycler – As part of this partnership with Greeniva Recycler, the company will ensure environmentally sound management of electronics that have reached their end of life phase. Greeniva Recycler has obtained all the necessary authorizations from the appropriate governmental agencies for their processing facilities. Greeniva Recycler ensures proper recycling and disposal of e-waste. This helps us protect the environment from any hazardous consequences, which would be otherwise caused by the inappropriate waste management of e-waste. As per our agreement with Greeniva’s Recycler, is any customer wants to hand over their products they can reach or call our e-waste recycling partners toll free number 1800-102-4919. Our representatives explain them about process of disposals and make them aware about nearest drop point available to drop the e-waste and also give information about incentive we will offer to them against their end of life products. 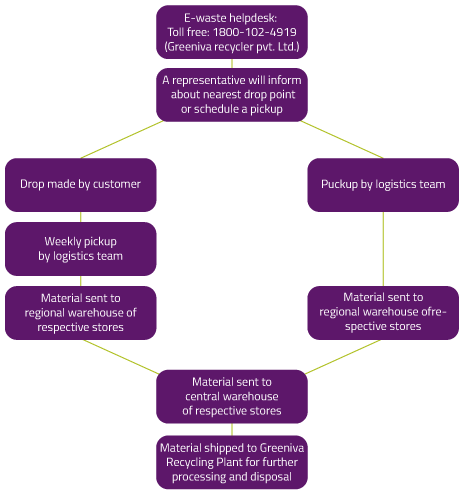 If any customer wants to handover the material from their door steps we do send either our logistics team or Greeniva Recycler team to collect the items and channelized the same to our e-waste partner plant for final processing. Each and every customer is advised and creates awareness about how can be handled the electronic goods and channelized it to be approved e-waste recycler as per E-waste Management Rule 2016. Lack of awareness among various stakeholders about the ill effects of the end- of-life products (E-waste), is the major concern in our country. For reducing the adverse impact on environment and health we need to initiate sustainable mechanism to create awareness among the stakeholders. Irdeto Technology India Pvt. Ltd. will launch awareness program on environmental hazardous of Electronic Waste under EPR Plan implementation. We are planning to provide financial support for conducting various awareness programs by Academic Institutions Industry Associations and Professional Organizations for organizing workshop/ seminars for schools/ college / resident/ welfare association (RWAs) / Bulk Consumers / Regulatory Bodies, Media Engagement etc. So that they can provide information regarding buy back program system of Irdeto Technology India Pvt. Ltd. and making campaign material for wide circulation on effect associate with e-waste.